1. Games are a form of fun. That gives us enjoyment and pleasure. 2. Games are form of play. That gives us intense and passionate involvement. 3. Games have rules. That gives us structure. 4. Games have goals. That gives us motivation. 5. Games are interactive. That gives us doing. 6. Games are adaptive. That gives us flow. 7. Games have outcomes and feedback. That gives us learning. 8. Games have win states. That gives us ego gratification. 9. Games have conflict/competition/challenge/opposition. That gives us adrenaline. 10. Games have problem solving. That sparks our creativity. 11. Games have interaction. That gives us social groups. 12.Games have representation and story. That gives us emotion. People are experiencing all of the freedoms of unstructured play, although games have defined goals and rules (Gee 2003, cited in Klopfer et al, 2009). Players submit to rules and structures only if they can continue to be playful. Gaming is the act arising from the combination of play with games and comprises of many elements. 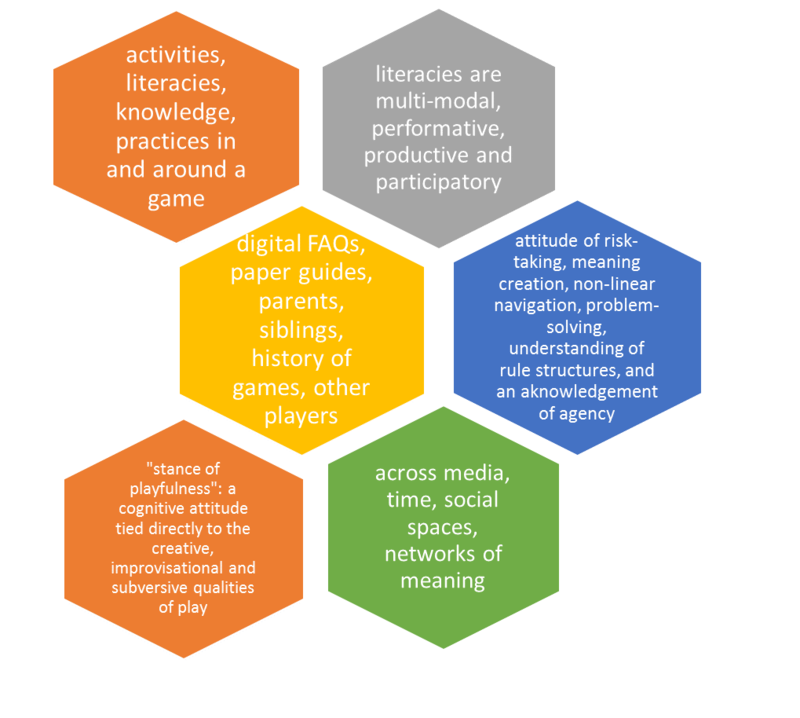 The graphic below attempts to present some of the elements involved in gaming as described by Klopfer et al (2009, pp.5). Simulation is the imitation of the operation of a real-world process or system over time. The act of simulating something first requires that a model be developed; this model represents the key characteristics or behaviors/functions of the selected physical or abstract system or process. Gamification takes game elements (such as points, badges, leaderboards, competition, achievements) and applies them to a non-game setting. It has the potential to turn routine, mundane tasks into refreshing, motivating experiences. Prensky, M. (2001). Digital game- based learning. New York: Mc Graw-HilI. This entry was posted in English, games-based learning and tagged definitions, gamification, Prensky, simulations. Bookmark the permalink.